1. 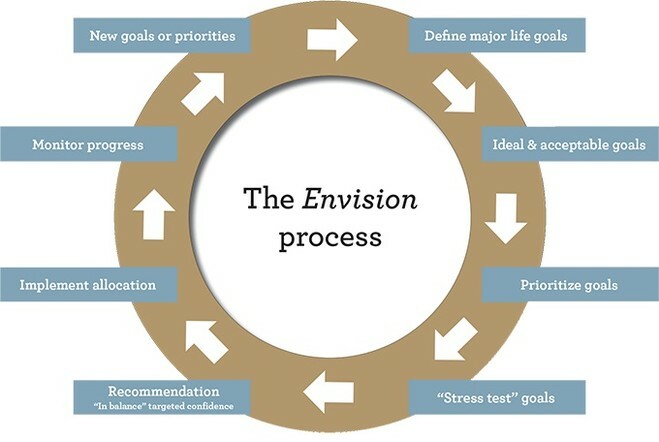 Define major life goals – The Envision process begins by allowing you to explore what goals and dreams you have while addressing the concerns you have about being able to achieve them. This important step serves as the basis for the conversations between you and your Financial Advisor as he or she accompanies you through the process. 2. Ideal and Acceptable goals – Throughout your conversations with your Financial Advisor, you explore your ability to achieve your goals in multiple scenarios, starting with the Ideal and the Acceptable. The Ideal scenario represents your goals and dreams in a "perfect world” scenario. Meanwhile, the Acceptable scenario represents the satisfactory compromises you could make to your ideal goals and still feel content with your life. 3. Prioritize goals – To explore as much of your Ideal scenario as possible, we encourage the use of our Envision Priority Cards. This interactive activity helps ensure that you and your Financial Advisor are on the same page, working together to achieve those goals you value most. 4. “Stress test” goals – To determine what level of confidence you can achieve with your Ideal and Acceptable scenarios, the Envision technology stress tests each scenario 1,000 times. During each of these 1,000 iterations your goals will be subjected to simulated random market returns (up years, down years, flat years, etc.) to help you determine how likely you are to achieve your goals. 5. Making a recommendation – Once your Financial Advisor has an understanding of your Ideal or Acceptable scenarios, he or she will also create a Recommended scenario for you that will incorporate the goals you value most while potentially deemphasizing some of your lower priority goals. 6. Implement allocation – Based on your goals, dreams, concerns, risk tolerances, and financial circumstances, your Financial Advisor can propose the appropriate diversification needed to help you achieve those goals. Our product-neutral approach allows your Financial Advisor the freedom to select products that will help optimize your ability to achieve your goals. 7. Monitoring progress (the “Dot”) – The most important part of the Envision process is the way you are able to monitor your progress toward the goals and dreams you wish to accomplish. Your Envision plan will update each night and create a benchmark unique to your goals and circumstances. This information can be displayed on your statements and online. 8. New goals and priorities – Change can present challenges, whether it happens in your own life or in the world around you. Whenever necessary, it is easy to update your Envision plan to account for the changes and measure the impact it has on your ability to achieve your stated goals. If your investment plan needs to be updated, the appropriate adjustments can be made at your convenience. IMPORTANT: The projections or other information generated by the Envision tool regarding the likelihood of various investment outcomes are hypothetical in nature, do not reflect actual investment results and are not guarantees of future results. Results may vary with each use and over time. ENVISION METHODOLOGY: Based on accepted statistical methods, the Envision tool uses a simulation model to test your ideal, acceptable and recommended investment plans. The simulation model uses assumptions about inflation, financial market returns and the relationships among these variables. These assumptions were derived from analysis of historical data. Using Monte Carlo simulation, the Envision tool simulates 1,000 different potential outcomes over a lifetime of investing varying historical risk, return, and correlation amongst the assets. Some of these scenarios will assume strong financial market returns, similar to the best periods of history for investors. Others will be similar to the worst periods in investing history. Most scenarios fall somewhere in between. Elements of the Envision presentations and simulation results are under license from Wealthcare Capital Management, Inc. & Wealthcare Capital Management IP, LLC. ©2003-2013 Wealthcare Capital Management, Inc. & Wealthcare Capital Management IP, LLC. Wealthcare Capital Management, Inc. & Wealthcare Capital Management IP, LLC are separate entities and are not directly affiliated with Wells Fargo Advisors.